Having recently travelled abroad, I somehow managed to slip up on my usually careful lip sun protection routine and the results weren’t pretty! Dry, cracked and quite frankly painful lips aren’t something that I’d aimed to achieve, but I was stuck with them anyway. Racing to the shops in search of a remedy, I planned to pick up the Blistex Intensive Moisturiser that I had previously loved. Yet when scouring the lip balm isle something else caught my eye. Recommended for distressed lips in need of rescue I headed straight to the checkout. 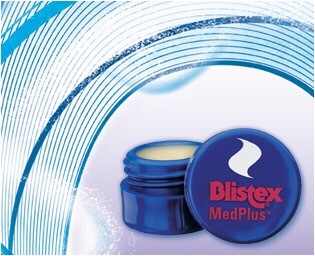 Overnight my lips were visibly healthier and although not yet back to their hydrated self, the Blistex MedPlus was definitely working. By day two my lips were back to normal and by day three they were more hydrated than ever! I have to say that this is by far the best lip care that I have ever used and that is a very bold statement. I still love my other balms of course, but when my lips are screaming for help, MedPlus is definitely what I’ll be reaching for. Oh, and it also has SPF 15 so is a great one to protect as well as repair! Available for £2.30 at Boots and Sainsbury’s. Choose from either a pot or the cherry flavoured stick.